As claimed in the viral Image of President Donald Trump involved in a live rescue operation of the Harvey flood victim. Doctored image of President Donald Trump involved in the live Harley rescue operation is doing the rounds. A doctored photograph appears to show the President on a raft in Texas saving a flood victim. Viral Message Verification – The Information floating all over the internet of the topper is fake. The image, unsurprisingly, is digitally altered. The Original image can be found at the site breitbart. 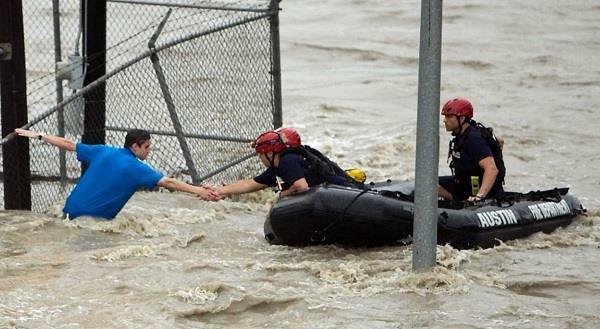 The actual pictures shows three rescuers reaching out to help a man clinging to a chain link fence out of the water.